A rare place along the Mediterranean coast, moving along with the sea in a woodland lagoon; BELDIBI. 25 km from the city center. BELDIBI, which is in the distance, is bound to KEMER district of ANTALYA. This town, which is located on the edge of the Taurus Mountains, has become a center of tourism with its incentives and changes of the zoning plan, while it was preceded by greenhouses and forestry. Beginning to grow at the same time as GÖYNÜK Town, BELDIBI attracts attention with its grand hotel which is parallel to the sea shore. The open beach is stony and the "Blue Flag" is awarded. Although there is periodic algae, there is water temperature which can be entered in every season. 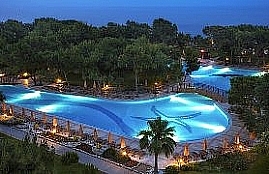 ANTALYA BELDIBI is a place preferred by more foreign guests. The five-star grand hotel here is fully booked in the summer months. In winter, a number of hotels, shops and businesses close down. Although the congress, business, and sporting tourists continue to come, the tourism season does not survive. These 5 star hotels generally accept package customers. That is, it works through travel and tour companies. Despite this, they accept daily guests. This, of course, costs a little more. One of the most beautiful aspects of BELDIBI is the accommodation of hotels, motels and pensions that fit every budget. That is why it is preferred. BELDIBI, the bazaar consists of only 2 corners. There are souvenirs, clothing, local foods and markets in the tiny bazaars on these streets. With some decisions taken in early 2016, it was planned that some of these small bazaar buildings would be demolished and replaced with newer and modern shopping areas. Many of the hotel's guests also visit other historic, natural and tourist attractions in the surroundings of BELDIBI during their holidays. ANTALYA Central, GÖYNÜK, KEMER, CAMYUVA, TAHTALI, TEKIROVA, PHASELİS and OLYMPOS are only a few of these. BELDIBI Rent a car companies are used to visit these places which are no more than 45 minutes away. ANTALYA BELDIBI rent a car, our company, BELDIBI hotels and other addresses to rent cars. The ANTALYA airport and Centraal rent a car offices work at all hours of the day. BELDIBI rent a car is enough to make use of our service or to contact us by e-mail and telephone. As you can get your car from BELDIBI, you can also benefit from rent a car free of charge from Airport and Bus Terminal. BELDIBI rent a car provides you with a safe and trouble-free holiday with its new model, automatic, diesel vehicles. You can call us as long as you are in BELDIBI. Do not forget that a drop charge is applied for short term rentals.